FFS is your source for information on Navy life in the Pacific Northwest. 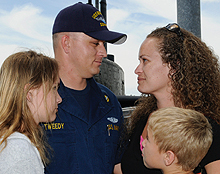 Find information on Navy events, entertainment, fitness, sports, Fleet and Family Support Programs, child care, youth and teen programs, outdoor recreation, single sailor activities, housing, dining, Navy Gateway Inns and Suites, and much more. With operational tempos higher than ever stress can take its toll on servicemembers and their families. Family services has a number of resources to help keep life in balance.